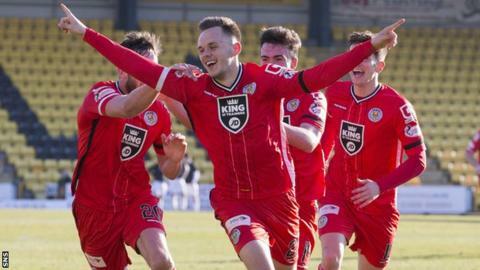 Lawrence Shankland scored twice as St Mirren beat second-bottom Livingston in the Scottish Championship. Stephen Mallan converted a penalty to give the Buddies the lead after Darren Cole had fouled Calum Gallagher. Liam Buchanan quickly levelled for Livi but Shankland's strike from outside the box had the visitors ahead again by half-time. Jordan White poked home for the hosts only for Shankland to fire an impressive volley and settle the match. Match ends, Livingston 2, St. Mirren 3. Second Half ends, Livingston 2, St. Mirren 3. Gary Irvine (St. Mirren) wins a free kick on the right wing. Corner, St. Mirren. Conceded by Craig Halkett. Corner, St. Mirren. Conceded by Mark Fotheringham. Substitution, Livingston. Daniel Mullen replaces Josh Mullin. Attempt saved. Jordyn Sheerin (Livingston) right footed shot from the centre of the box is saved in the centre of the goal. Substitution, St. Mirren. Steven Thompson replaces David Clarkson because of an injury. Substitution, Livingston. Jordyn Sheerin replaces Osman Kakay. Substitution, St. Mirren. Alan Gow replaces Alex Cooper. Goal! Livingston 2, St. Mirren 3. Lawrence Shankland (St. Mirren) right footed shot from outside the box to the top left corner. Keith Watson (St. Mirren) wins a free kick in the attacking half. Substitution, Livingston. Morgyn Neill replaces Darren Cole because of an injury. Corner, Livingston. Conceded by Jamie Langfield. Attempt saved. Liam Buchanan (Livingston) right footed shot from the right side of the six yard box is saved in the bottom right corner. Attempt missed. David Clarkson (St. Mirren) header from the centre of the box is close, but misses to the right following a set piece situation. Alex Cooper (St. Mirren) wins a free kick in the defensive half. Substitution, St. Mirren. Stuart Carswell replaces Scott Agnew. Charlie Telfer (Livingston) wins a free kick in the attacking half. Corner, Livingston. Conceded by Gary Irvine. Corner, Livingston. Conceded by Jack Baird. Corner, St. Mirren. Conceded by Darren Cole. Osman Kakay (Livingston) wins a free kick on the right wing. Goal! Livingston 2, St. Mirren 2. Jordan White (Livingston) right footed shot from very close range to the top right corner.